If you are a knitting or crochet enthusiast, why not lend your time and skills to a good cause this Friday? Shire Libraries are holding a number of Knit-In to create blankets to warm those in need. Refreshments will be provided. Bring your own materials and wool. For anyone who cannot make it to a Knit-in, you can drop off completed blankets to Sutherland Library until the end of August. A recent article in The Australia has highlighted the success of the Sutherland Library 'Taming Technology' Series. Started in November 2011, library staff and guest speakers have been presenting monthly information sessions on a variety of technology topics, to give older adults a greater understanding of items like digital cameras, smartphones, computers, eBooks and using online programs such as Ebay and Picasa. These free sessions are an overview of the topic, including handouts and a glossary of relevant terms. The below video by The Australian gives you a look at how the sessions are going. If you are an older adult interested in attending the next Taming Technology session - 'Introduction to Facebook & Twitter' visit the events page to book online. The Prime Minister's Literary Award Winners have been announced by the Prime Minister and the Arts Minister, Simon Crean today at the National Library of Australia. Now in its fifth year, the Prime Minister's Literary Awards recognise and reward excellence in Australian literature and history. Congratulations to all the winners, each of whom received $80, 000 prize money. The New Items lists that were available in the previous library system were very popular with our members. These lists were a function that was built into the old library system. Unfortunately, the library's new computer system does not have the same built in functionality. The Library fully intends to re-introduce the New Items lists, although they may be in a different format. We need to firstly ensure the data/records that were migrated from the old system to the new system is completely correct and up to date. Then we need to work with the functionality available in the new system to create new items lists. This is taking a little longer than we had hoped as there has been some issues hanging over from the data migration that need to be resolved first. For instance, since all the collection records were added to the new system on the same date (of migration - 21 June 2012) everything in the system was equally 'new'. Some weeks have passed now and we are able to start seeing new records being added to the collection. We have begun work on a preliminary version of a list of New Adult Fiction at the library, however, this needs some more work to ensure that the search logic we are using is indeed showing new items added to the collection. Once we are happy that this list is correct we will make it available publicly. It should also be relatively straight forward to extend the same process to other collections, eg. new Biographies, etc. We apologise that the New Items lists are taking so long to restore and appreciate your patience while we craft a solution. Keep your eye on our website over the coming weeks and you should see the new items lists returning shortly, in one form or another. This month, continue celebrating The National Year of Reading, 2012 by discovering Australian Authors. Read or re-read something by one of our Literary Legends, or discover a book by a new and upcoming talent. An easy way to discover Aussie books is to look for the read and white kangaroo sticker pictured on the spine. Here are some Australian authors you may like to read. Want more? Try these Literary legends, Classics, and Popular Australian Authors. Have you got a favourite Australian author? Tell us about them in the comments. The July School Holidays are over and the library held 20 activities for the kids to enjoy. Feature Creatures were back and visited Sutherland, Caringbah and Cronulla Libraries. Rangers on the Run came to Miranda and Engadine Libraries, everyone enjoyed touching the bugs! The Engadine Knitters group and staff joined the budding young knitters and assisted them with beginnings of their scarf. Trevor's Drawing Workshops were once again fully booked out at Sutherland and Menai Libraries. The Kids at Cronulla Library enjoyed a Wii Gaming afternoon. A huge thank you to all the kids who joined us around our libraries for Beastly Bug Fun, the staff were delighted to see the creative bugs that all the kids made. It was a delight for staff to see many library regulars at Hazelhurst for Storytime. Over the days we read stories and entertained over 300 kids and adults surrounded by the magnificent 'Look! : the art of Australian picture books today exhibition. Enjoy Term 3 and remember we can help you during term with your school assignments and reading suggestions. The next school holiday activities at the library are being planned now. Wow great news! We now have access to new Your Tutoring subjects - Business Studies, Economics and Commerce. Tutors services team spent six months interviewing screening and testing applicants to fill these new subjects streams to build a high quality base of online tutors and teachers just for you. If you haven’t heard about YourTutor it’s a fabulous service for primary through to high school students connecting them with expert tutors live. A one-to-one individual learning session via the Internet. It’s live, anonymous and no appointment is required. So no more excuses for bad marks. You now have access Monday to Friday 4-8 pm to professional experts in the areas of Maths, Science, English, Study Skills, Business Studies, Economics and Commerce. So what are you waiting for? Jump on a computer and finish that homework you have been putting off or why no check out the great how does it work video on our website to find out how Your Tutor can help you. Looking for a laugh? Celebrate the National Year of Reading July theme, Discover, by discovering lots of humorous books, both fiction and non- fiction in your library. An easy way to find the fiction titles is to look for the blue smiley face on the spine. Obviously, what's funny to one person may not be funny to another...meaning its no laughing matter to recommend humorous books! A book that causes you to laugh out loud may leave someone else completely unmoved. Whether you prefer satire, black humour, gentle humour, slapstick or farce, here is an assortment of authors who have written books that will make you laugh, or at least, smile. The National Year of Reading has created a fantastic opportunity for new, emerging and established Australian writers. Its never too late...to learn to read is a short story competition with potential to help those 46% adults who struggle with literacy. As part of Adult Learners Week, 2012, you are invited to write a short story (3,000 words or less), which achieves the goal of supporting and encouraging more adults to learn to read. The aim is to inspire, excite and challenge the reader, highlighting the fact it's never too late... to learn to read. If you are interested, get writing, and enter your story online by 6 August, 2012 at 5pm. You can find out more at Its Never too Late... to Learn to Read- National Year of Reading. Winners will being announced publicly during The Reading Hour, 25 August, 2012. Hold/reserve fees are now only placed on requests for Adult materials, regardless of whether the library member holds a junior or adult membership. Prior to the installation of our new library management system, reservation fees were incurred based on borrower type - adult borrowers were charged a fee, regardless of the material type, and junior borrowers (under 18 yrs) were not. With fees being applied in that way we found that a number of adult members were being charged hold fees for requesting books and other material for their children because their children weren't members or they didn't have their card with them. In addition, some adult members were taking advantage of the system and requesting their own books under their child's name to avoid the hold fee. With the change of library computer system we have made the change to the way that fees are charged for reserved material. Requests for material from the adult collection are charged at $1.00 per item. This applies to both adult and junior members. There is no charge for items requested from the junior, HSC or Young Adult collections for any library member. There is a notice to this effect shown on the library catalogue at the time you place a request. The Library's Conditions of Membership as well as Council's updated schedule of fees and charges also reflects this policy. We apologise for any inconvenience that our members may have incurred as a result of this fee change. 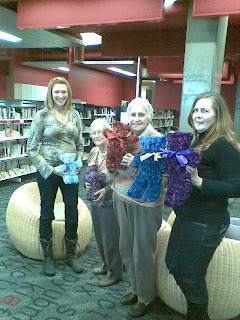 Lots of fun and interesting shaped scarfs were created at Engadine Library during the recent Holiday Knitting workshop. 16 eager novice knitters were in capable hands thanks to the generosity of library staff and the Engadine Knitting Group who supported this activity by being volunteer trainers. Some pictures of the wonderful creations are supplied. Continue your quest of discovery of new genres of fiction to read during July with historical fiction. Reading historical fiction is both an educational and enjoyable way to discover more about the past. Significant people, places and events from past times are bought to life, often combining a carefully researched, accurate, factual base with the fictional story. Reading a good historical fiction novel can even act as an inspiration for more research about the actual historical events! No matter what period of history interests you, there is sure to be a historical novel covering that era which will capture your imagination. To discover historical fiction in the library, just look for the castle genre label on the book spine. Here's a list of well known historical fiction authors to get you started. The Cronulla Library, Cronulla Crafters Knitting and Crochet Group have stepped up to assist the Parkinson's Disease Association by donating their time and skills to knit teddy bears for fundraising efforts. When Cronulla Library Staff were approached by a representative from the association requesting assistance, they knew just who to ask! The Cronulla Knitters enthusiastically jumped on board the opportunity to help, knitting a number of teddy bears. Another founding member of the Cronulla Crafters group, Dawn also knits trauma teddies for premature babies and hats for the children's oncology ward for Westmead Hospital. We at the library believe that this kind gesture should be acknowledged, thank you and well done Cronulla Crafters! If you would like to join in the crafting fun at Cronulla, simply call the library on 9523 4980 or visit the What's On page for more details. Discover is the National Year of Reading theme for July, and we are asking you to ‘Discover’ what the new library search, Encore, has for you. There are a number of new features in your library account that you might not yet know about and we are encouraging all library members to take a look and update their account details. For instance, did you know that you can now opt in to have the library save a record of all the items you borrow? Or that you can elect to receive messages from the Library via email? To take advantage of these new options you must make some choices for your own personal library account. Since you have to login to your account to update your preferences it's a perfect time to make sure that your contact details (phone, address and email) are all up to date as well. For some extra motivation (as if you needed it!) we are offering everybody who checks/updates their personal account details during July the chance to win a $200 JB HiFi voucher. For your chance to win just login to you library account online during July and check / update your contact details and account preferences as necessary. Then click on the Enter Now button on the account page, add your name, phone & email and you're in the draw to win. You will need your Library Card number (the barcode number on your card) and PIN. If you don't know your PIN you will need to visit one of the Shire Libraries and ask for it to be reset. You could take that opportunity to ask our staff to show you how to login. Items checked out - a list of items on loan to you and their due dates. 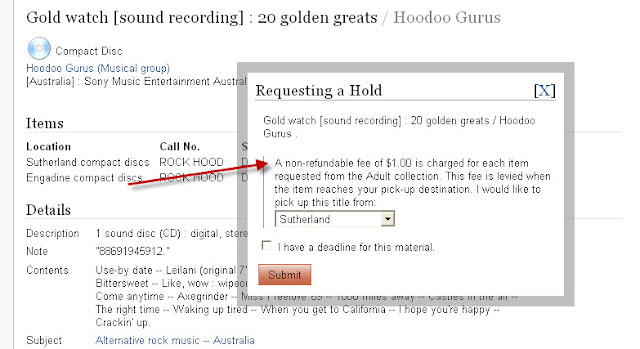 Requests (hold) - Lists the items you have requested & your place in the queue. Unpaid fines and bills - Provides details of the outstanding charges. Modify PIN - change your PIN. Preferred Searches - View and manage your favourite to searches to quickly run them each time you login. Reading History - Opt in to keep a list of all the items you borrow from this day on. My Ratings - See the ratings you have given items in the catalogue. My Reviews - Manage the reviews you have added to items in the catalogue. My Lists - Save items from the catalogue in personalised lists. Check the Library website for full details of the Competition Terms and Conditions. The July theme for The National Year of Reading, 2012 is Discover, making this is the perfect month to discover new genres to read. To celebrate this theme, each week the Library will feature a different genre that you may like to discover more about. This week, discover fantasy novels, and celebrate the power of imagination. Fantasy novels have timeless appeal and are the ultimate in armchair travel, taking you to other worlds filled with unknown creatures and beings, all without having to leave the comfort of your reading chair. They are often written in a series, allowing you to keep reading and discovering new storylines about your new favourite characters and settings. Discover make-believe worlds filled with castles, dungeons, dwarfs, dragons, unicorns, knights, witches, wizards, and of course, magic. To help you your quest of discovery at the library, the fantasy novels are those that have a dragon genre label on the spine. Here are some well known authors of the fantasy genre to get you started on your journey of discovery. The National Year of Reading, 2012 July theme is Discover. July is the month to discover, or re-discover your library, online or in person. Discover information, entertainment, events, programs and of course, books! Discover, or (re discover) the magic of reading, and being read to. Bring your lunch to the library the 1st Wednesday of each month, for the Literary lunch, the next being held 4th July, and be entertained as you eat with Library staff reading out short stories for adults. Discover the new look Library Catalogue. It has easier searches, allows you to rate your reads, create reading lists, reviews and even tag books. Ask your librarian to show you the new features. Discover e-books and audiobooks, via Overdrive, available on the Library website. Have you discovered Freegal yet? 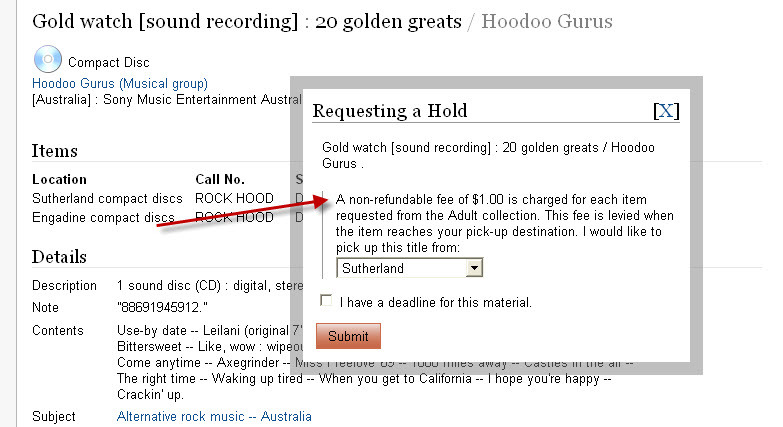 A great place to get free (and legal) music downloads. It’s available from the library website, along with lots of other databases where you can discover the answers to many questions. Discover a new genre, and find new authors. Join a book group, or take up the challenge of reading outside your comfort zone. Each Monday of July read the Library News post featuring one of four different genres for you to discover. Discover how you can find Fantasy, Historical, Humourous and Australian authors the library. Come into the library and see what else you can discover, today.